Managing Aerospace and Defense development programs is no easy feat. This eBook provides guidance on technologies that aid manufacturers in the move from reactive to proactive program management. Managing Aerospace and Defense programs is one tall task. The problem, of course, always lies in coordination. Keeping customers, suppliers and countless project teams on the same page is nigh impossible. That leads to an environment where program managers are almost always fighting fires, putting in super-human effort to stay on schedule. 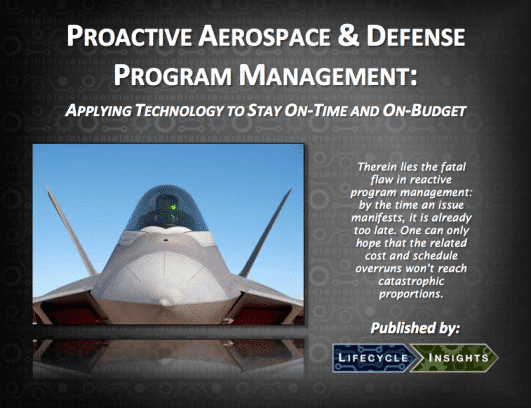 This eBook looks at how Aerospace and Defense manufacturers are aiming to make a switch from such reactive program management approaches to more of a proactive stance. Such a change with the right enabling technology changes the landscape of program management to the benefit of company profitability. This eBook is of most value to Program Managers in companies serving the Aerospace and Defense industry, as it focuses on the specific trends and needs of those roles in that industry. Specifically, this eBook is helpful for Program Managers in the process of transitioning from a reactive role to a proactive one. Today’s programs gain incredible organizational momentum from start to finish. Countless projects run concurrently and independently. Departments ranging from procurement to service to quality and more are heavily involved, diversifying the types of participating stakeholders. This occurs in an environment where suppliers with system responsibilities are globally dispersed. Once the program is started, it is incredibly challenging to make any changes, no matter how brilliant the plan or how much effort is invested. Therein lies the fatal flaw in reactive program management: by the time an issue or risk manifests, it is already too late. One can only hope that the related costs and schedule overruns won’t reach catastrophic proportions. So how do you prevent such issues? The answer lies in a shift from reactive to proactive program management. Program Managers must identify potential risks, issues and opportunities (RIO) before they fully manifest. They must facilitate and coordinate cross-disciplinary, multi-organization collaborative efforts around the globe. Every company wants to be proactive. Doing so, however, is far easier said than done.